Tattooing over scars: what is it about? One of the most practical ways to cover a scar after surgery or an accident is definitely tattooing over scars. The first thing we do is evaluating the type of scar and decide if it can be tattooed. Then, we extrapolate a mould with a specific technique, and this mould is imported with a photo editing program. 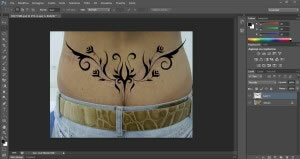 At this point, we draw a tattoo according to the indications of the customer and the shape of the mould of the scar. Tattoos overs scars are not just tattoos, but require a specific procedure and suitable equipment, which must be appropriately set up, not to traumatize the tissue too much. Tattoos over scars ensure the total coverage of the damaged tissue, but must be carefully studied with the operator using a PC. Having considerable experience in this field, I developed a special system which is precise and allows to get results that are consistent with the initial design. The cost of these treatments should be evaluated case by case, so if you have a scar to cover you should make an appointment with me, so that I can examine your scar and tell you how you should proceed. Or, you can send me an email including a picture of the area to be treated, but, in this case, I will have far fewer elements to achieve my goal, which is “erasing” your scar.